Understanding the nature of purchasing a piece of furniture as we do, we don’t just trade as an online store, we also have a large showroom in Carlisle’s City centre so people can get up close and really appreciate the furniture in its own right. Our store is set over six floors in West Tower Street within the historic quarter of the City of Carlisle. We have been supplying beautiful quality, hand made furniture throughout the Country for the past 22 years. Choice by name, Choice by nature. We offer a wide choice of designs, styles and finishes to suit the discerning customer who has an eye for detail and quality. Craftsmen and manufactures have been selected from the very best of the furniture industry to provide us with collections that take in a great many styles, so whether your after a hand finished leather Queen Ann chair to relax in front of the fire or a modern media cabinet to accommodate your plasma TV, we are sure we’ll have the piece to tempt you. 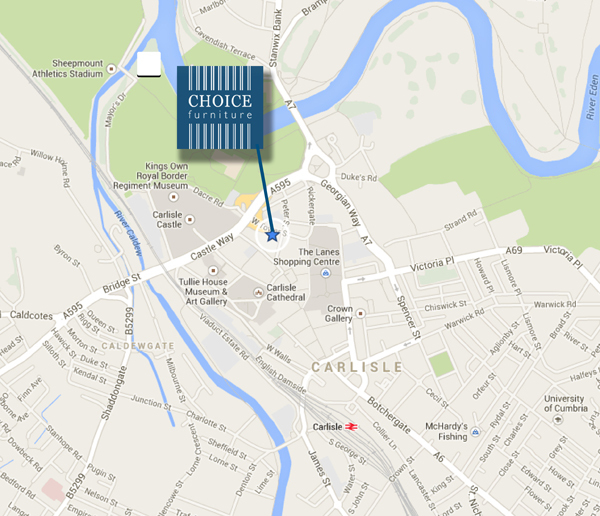 You will find us in Carlisle’s City centre, Just off the A595 and 2 miles from the M6 junction 43.